Obtained from the Angora rabbit by shearing or epilation. The main regions in which it is bred are Europe and eastern Asia. Its habitat is Turkey and the Black Sea region. The Angora rabbit was brought to central Europe from France in the second half of the 19th century. A. w. is one of the finest textile fibres of all - it is soft, lightweight,warm and relatively long (may exceed 60mm). Between 0.9kg and 1.1kg of wool is exploited annually. 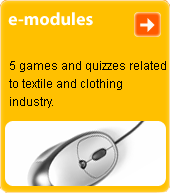 Used in the production of fabrics and knitted goods, mostly as a blend of wool and other fibres to a 100% limit. Products are notable for their lightness, softness and warmth. Highly suitable for producing bed linen for hospitals.